There are people that describe having an intense urge to travel, to explore the world and embrace its uniqueness as having ‘wanderlust’ or ‘itchy feet’. I am most definitely one of those people, especially when we haven’t even been out of the city in months. I have an incredible urge to just get in my car with a full tank of gas and see where it takes me, or on some random plane to who-knows-where. I’ll probably satisfy this urge in the next few weeks with a nice drive in the country just as the buds are coming out on the trees. That ‘spring green’ doesn’t last for long so we need to enjoy it while we have it! Do you get the urge to bake? I get the this same intense urge which I could call ‘bakerlust’ or ‘itchy hands’ when I haven’t baked anything in a while. Right now I am so busy with football and organizing some local food festivals, that I barely have time to cook, let alone blog about it. I’m just itching to get right back in the kitchen! When I saw my friend and fellow blogger Nicole’s gorgeous Paska Bread on my Instagram feed, I was so inspired! I shut down my email inbox, hid my excel charts, and pick up my flour and yeast. The kitchen was calling my name. One project that I’ve been putting off for a crazy amount of time is baking Babka. I never grew up with Babka, but I do know that I fell in love with it the minute I saw one for the first time. With all those contrasting layers of chocolate (or cinnamon) a Babka is always an impressive sight to behold. Chocolate or cinnamon (according to Jerry Seinfeld) Babka’s are the most traditional of Babka’s, but in the last few years there’s been a bit of an explosion in Babka experimentation. I fell in love with Pistachio Cream around Christmas time when I used it to fill chocolate chip thumbprint cookies (which I have yet to post!) 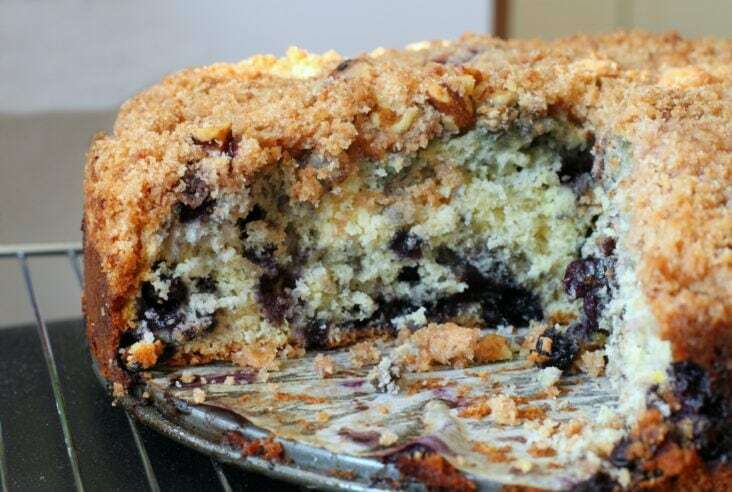 and I thought it would make a great addition to all the Babka variations out there. This dough is super sticky and buttery. I found the best way to mix it was by using my Kitchen Aid stand mixer for the first half of kneading and leaving out the last half cup of flour. When I turned the dough out to knead it by hand, I sprinkled it every so often with a bit of flour so that it didn’t get so sticky/greasy as I was kneading. I like to proof my bread in a warm oven but you have to be careful not to have it too warm with this dough because the butter will melt easily, making the dough too greasy. Just leaving the oven light on was enough for the proofing stages. We like pistachios a lot, so I scattered extra on top of the pistachio cream before rolling up the dough. It takes a bit of perseverance to roll that dough up evenly. Once the ends are pinched, you can guide the dough a bit more so that it becomes a more uniform cylinder. After the dough is cut lengthwise into two, the halves must be carefully twisted…I only did 3 twists but you can do as many as you want. The only difficult part is gently bringing them back together so that they fit into a 9 x 5 inch loaf pan. I couldn’t resist pressing a few pastel coloured mini eggs into the babka before baking. 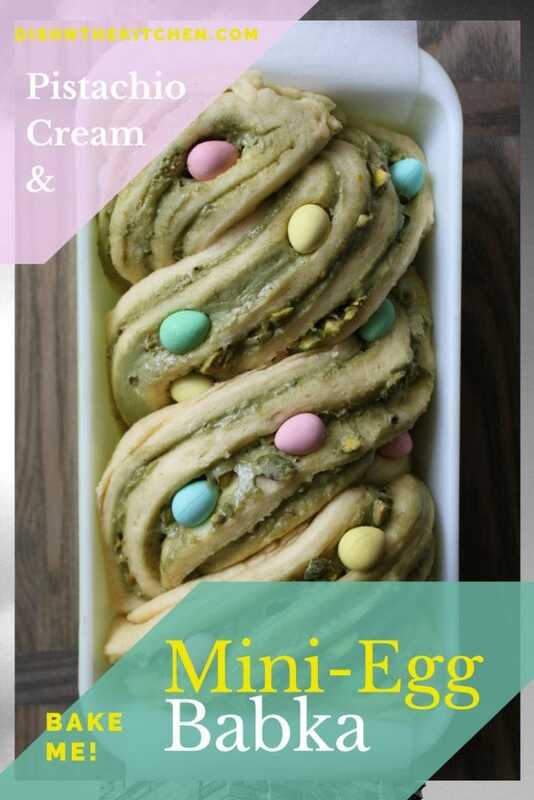 They really did complete this Pistachio Cream and Mini Egg Babka. Looks impressive, tastes even better. Babka is a special sweet treat! Place warm milk in the bowl of a stand mixer. Sprinkle yeast grains over top and let sit for 10 minutes to activate. In a large mixing cup mix eggs, salt, and sugar. Add to the milk. Slowly add flour, reserving the last 1/2 cup. Mix the dough with a wooden spoon. 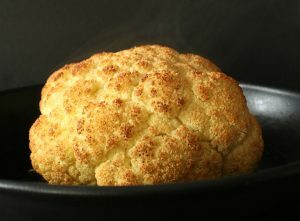 Gradually add the butter, several cubes at a time, waiting for them to become incorporated in the dough. Mix the dough on low (using the dough hook) until it clings together but don’t worry it will still be quite dry. Turn dough out onto a surface and knead by hand. Add the last half cup of flour as the dough becomes sticky/greasy. Keep on kneading and adding until all the flour has been incorporated. Place dough back in stand mixer and knead for another 10 minutes using the dough hook. Your final dough should be smooth and come away from the sides of the mixer easily. 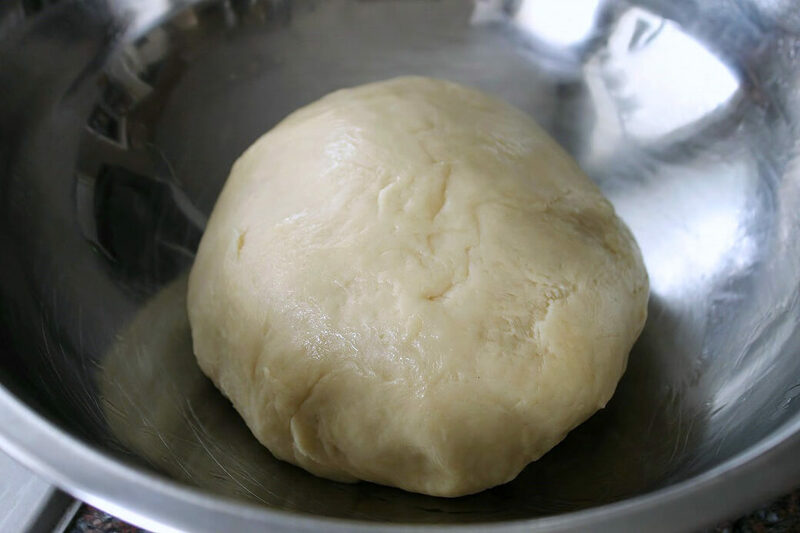 Place dough in a draft free spot and let rise until doubled. This took about an hour in my oven with the light on for a bit of warmth. 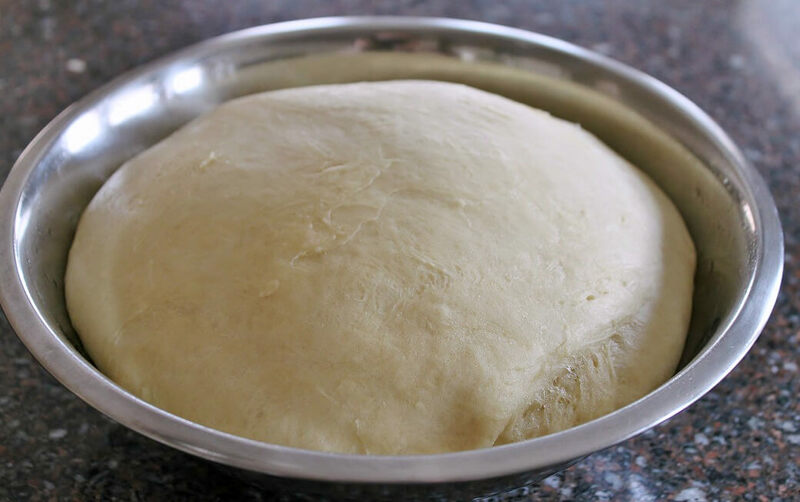 Remove the dough from the oven, turn out onto a lightly floured surface and roll into a 16×10 inch rectangle and orient so long side is facing you. 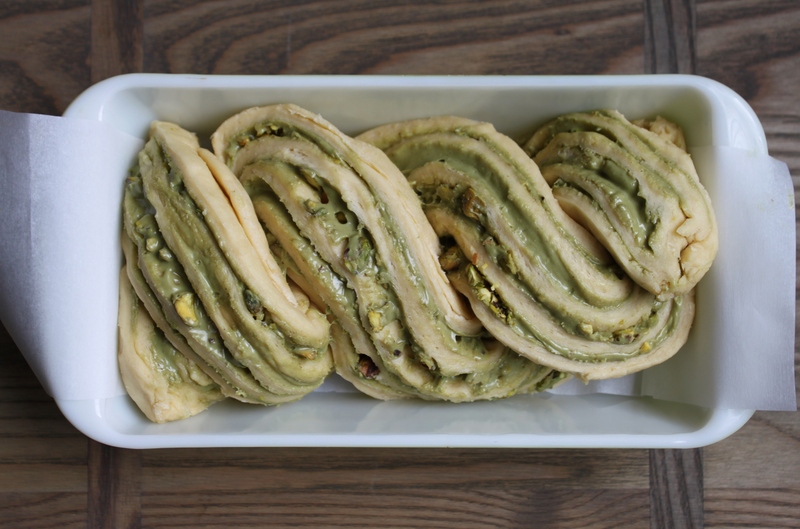 Spread the Pistachio Cream evenly over the rectangle, leaving an inch bare on all sides. Evenly scatter the chopped pistachios over the dough. Roll the dough up and away from you. You may have to stretch some of the dough to make an even roll. Pinch edges together and make sure seam stays shut. With seam side up, cut the roll (with a serrated knife) into two halves lengthwise along the seam. Carefully twist the two halves together in as many twists as you wish. I did three twists. Cut an 18 inch strip of parchment paper. Lay it along the base of a 9 inch bread pan and make sure there’s extra over the edges. Lightly coat pan with spray. Carefully condense the loaf halves together and lift into the prepared pan. Cover loosely with plastic wrap. Place loaf in a draft free spot and let rise until doubled. This took about an hour in my oven with the light on for a bit of warmth. Place mini eggs in the cracks, if using. Bake in a 350° F pre-heated oven for 35 minutes. Let cool in pan for 15 minutes then lift out and continue to cool on a rack. Yay! So glad I inspired you to get back to baking! Your Babka is mesmerizing and I would give anything for a nice thick slice (and a handful of the leftover mini eggs). Next up, the prune babka. seriously. wow. that’s amazing! it’s so creative. what the heck is pistachio cream? They look amazing and I know for sure my daughter will love them. Going to try them soon. I get both the wanderlust and bakerlust 🙂 ! I get so itchy if I don’t bake for a few days… Making brioche dough is so satisfying! It requires your time and attention, but the reward is incredible. Your babka looks wonderful! I buy the pistachio cream at Eataly, I did not know they sold it here. Good to know! It is SO satisfying! Yes, I get the pistachio cream at the Italian Centre…it’s just delicious. 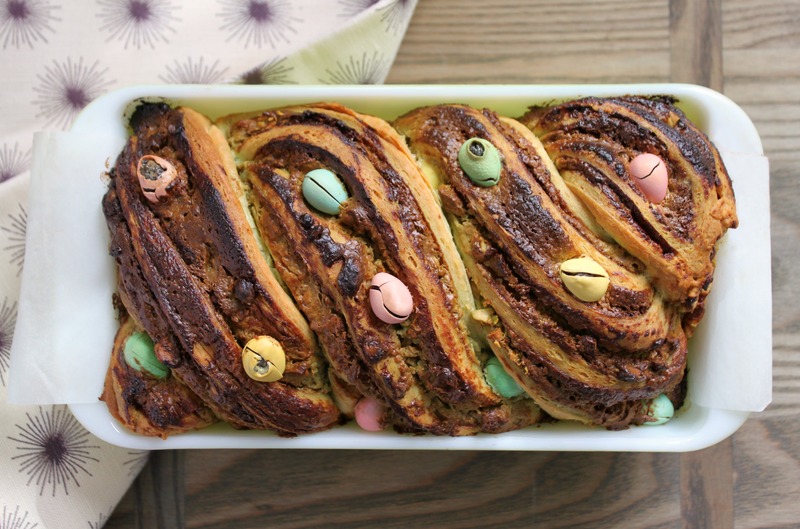 I’ve always wanted to make babka, and this one is so creative with the pistachio cream and mini eggs! Great process shots too Bernice! haha ditto. True story: I had to buy a few bags in the making of this post! haha What baby wants, baby gets! Hope you are feeling well.